Join Jay Baer, founder of Convince & Convert, New York Times best-selling author, and Hall of Fame keynote speaker for this special live broadcast where he'll showcase how to best leverage video to supercharge your demand gen (and ABM) programs. Plus - the entire session is only NINE minutes long. In the amount of time it takes to decipher a Kanye song, you'll learn 7 useful ideas on how to use video to create new customers. How's that for a fair trade!? Save your seat now for 7 Ways to Use Video to Supercharge Your Demand Gen January 29th at 2pm ET. Can't make it live? RSVP either way and we'll send you the (9-minute) recording. Sure, video consumption keeps growing every year. And maybe you've committed to creating more video in 2019. But there are a LOT more ways and reason to use video than you think, especially for demand gen. Join Jay Baer, founder of Convince & Convert, New York Times best-selling author, and Hall of Fame keynote speaker for this special live broadcast where he'll showcase how to best leverage video to supercharge your demand gen (and ABM) programs. Plus - the entire session is only NINE minutes long. In the amount of time it takes to decipher a Kanye song, you'll learn 7 useful ideas on how to use video to create new customers. How's that for a fair trade!? Save your seat now for 7 Ways to Use Video to Supercharge Your Demand Gen January 29 2pm ET. Can't make it live? RSVP either way and we'll send you the (9-minute) recording. Join Jay Baer, founder of Convince & Convert, New York Times best-selling author, and Hall of Fame keynote speaker for this special live broadcast where he'll showcase how to best leverage video to supercharge your demand gen (and ABM) programs. Plus - the entire session is only NINE minutes long. In the amount of time it takes to decipher a Kanye song, you'll learn 7 useful ideas on how to use video to create new customers. How's that for a fair trade!? 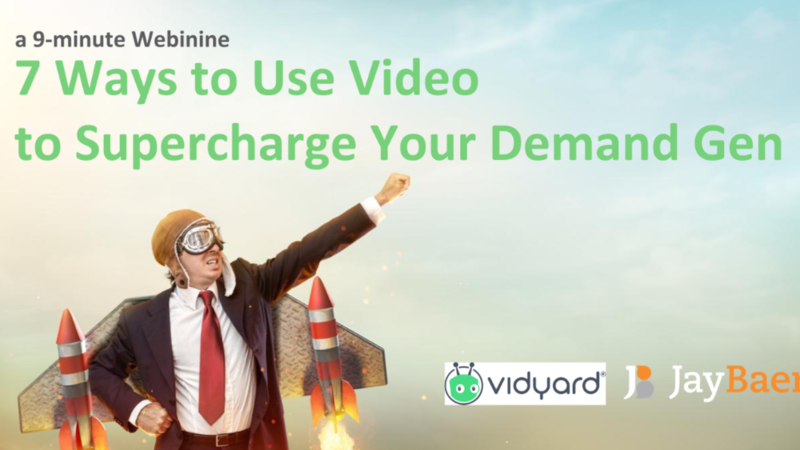 Save your seat now for 7 Ways to Use Video to Supercharge Your Demand Gen January 29th at 2pm ET. Can't make it live? RSVP either way and we'll send you the (9-minute) recording.